Shepherds, Wise Men, Animals: Were They All There? The traditional representation of Jesus' birth includes a manger surrounded by shepherds, wise men and farm animals. But did it really happen that way? Many theologians acknowledge that the accepted Nativity scene is a result of 2,000 years of interpretation and elaboration. Shepherds, Wise Men, Animals: Were They All There? 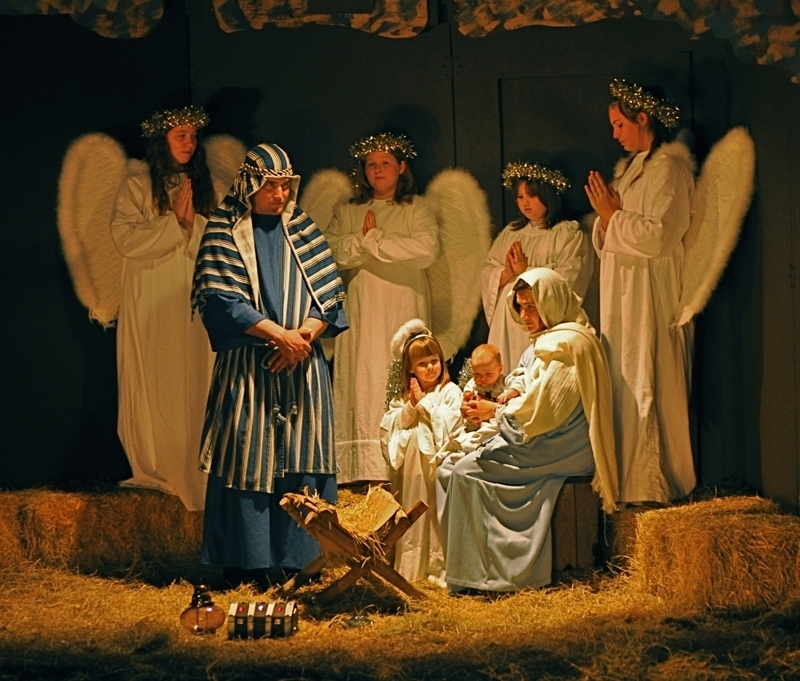 The First United Methodist Church of Johnson City, Texas, has staged an extravagant living Nativity story every December for the past 50 years. While costumed children and adults from the congregation act out the pageant, the narration is provided by a 1959 recording of Perry Como. Every December, the First United Methodist Church of Johnson City, Texas, stages an extravagant living Nativity story. People drive from all over Central Texas to sit under the stars amid the live oaks and watch the Christmas story acted out. "The production begins with 200 people in the stands," says Pastor Sid Spiller. "And in comes Joseph and Mary. Joseph is leading a miniature donkey. That was unique this year. They are pointed into the manger scene by an innkeeper. Then comes the angels giving word to the shepherds." The production begins with 200 people in the stands, and then in come Mary and Joseph. 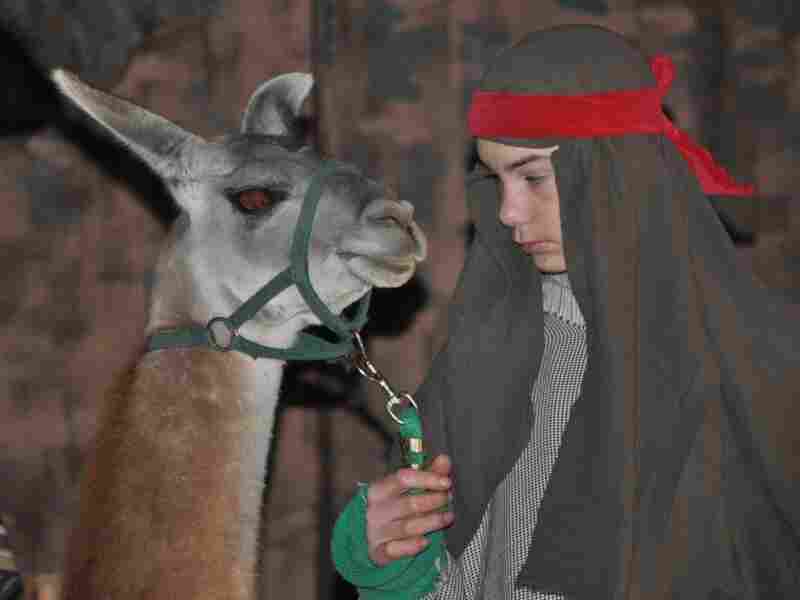 Above, a shepherd stands with a llama. While costumed children and adults from the congregation act out the pageant, the narration is provided by a 1959 recording of Perry Como. "Yes, the three men on the camels are the three wise men," Como narrates, as a celestial-sounding orchestra plays behind him. "The new star guides them straight to Bethlehem, to a little baby lying in a manger. There the three wise men present gifts to the Christ child." Only a Grinch would accuse Como of flubbing the Christmas story, but many theologians acknowledge that the accepted Nativity scene is a result of 2,000 years of interpretation and elaboration. "St. Francis of Assisi, when he created the notion of a creche or a manger scene with animals and so forth, was making a theological point," says the Rev. William Lawrence, who is dean of the Perkins School of Theology at Southern Methodist University in Dallas. He points out that the creche, as we know it, is the invention of the animal-loving St. Francis in 1223 in the town of Greccio, Italy, to celebrate the birth of Jesus. Lawrence says it's challenging to re-create accurately what happened that night based on the biblical record. "Well, if you look at the bare bones of the two narratives in Matthew and Luke, each one clearly tells the story of the child that was born," he says. "Bethlehem is identified as the place, but beyond that the details of the two narratives vary considerably." Only the Gospel of Matthew tells of the Magi, or wise men, following a star, but he doesn't say there are three of them, and they likely arrived quite some time after the birth. Only Luke mentions a manger, shepherds and a chorus of angels. There's no mention in either version that Mary rode into Bethlehem on a donkey. And there's no mention of any animals in the stable — though one can assume some were present. In fact, there's almost no overlap in the two Gospel accounts. Only Matthew tells of the Magi, or wise men, following a star; but it doesn't say there are three of them, and they likely arrived quite some time after the birth. Only Luke mentions a feeding trough, or manger, shepherds and a chorus of angels. There's no mention in either version that Mary rode into Bethlehem on a donkey. And there's no mention of any animals in the stable -- though one can assume some were present. The problem is the lack of eyewitnesses to the birth of Jesus, compared, for instance, to the crowds who watched his crucifixion. "The detail about the death of Jesus is great. The detail about the birth of Jesus is minuscule," says the Rev. Philip Turner, an Episcopal theologian and retired associate dean of the Yale Divinity School. "But insofar as the birth narratives are concerned, the story as it's told is told by both Matthew and Luke to make certain points about Jesus." For instance, Turner says, Matthew wants to convince early Christians that Jesus' birth is not just for the Jews, but for Gentiles, too. So he tells of the wise men who come from the east -- far from Israel. And Turner says Luke plays up the shepherds to emphasize lowly people who follow Jesus. "The shepherds play a very important part," he says. "And it's the simple people who recognize who Jesus is. The powerful ones put him to death." So the image of the creche with its little figurines arrayed around the straw-filled manger may or may not be historically accurate, but that doesn't diminish its usefulness, or its emotional power, according to Turner. "I actually love creches because they put together in one place a history of piety that to me is true," he says. "He is the son of God. He is God with us, which is Matthew's favorite term for him. He is Emmanuel." Last year, the pageant producers in Johnson City, Texas, decided to be more historically precise. So they took the wings off the angels and put turbans instead of crowns on the wise men. Nobody liked it, and this year, they changed it back.